Full value to the Capitals for a good hardworking win. Dogs had countless chances to tie it late but couldn't get a bounce, too little too late. Not the party everyone hoped for to end 2012. Second place is still quite nice, here's to a bunch of wins in 2013. Happy New Year - BE SAFE, BE SMART! 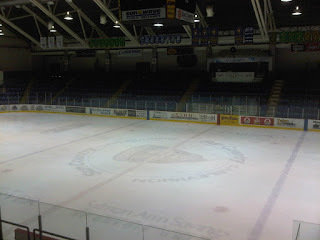 Should be a fun one tonight as 2012 comes to an end with the Bulldogs (17-11-1-5, 2nd Island) hosting the Cowichan Valley Capitals (7-19-0-2, 5th Island) at the Dog Pound. Great game from the Bulldogs Saturday night in Powell River, as it was apparent early in the game that the Dogs were more ready to play than the Kings, leading to a 3-0 Dogs lead. My hope tonight is that the Dogs are ready to play against the Capitals. It would be easy to take the Capitals lightly - no offense intended to the Caps in saying that, but they are a last placed team. The Dogs hopefully learned their lesson the last two times they played the Capitals. 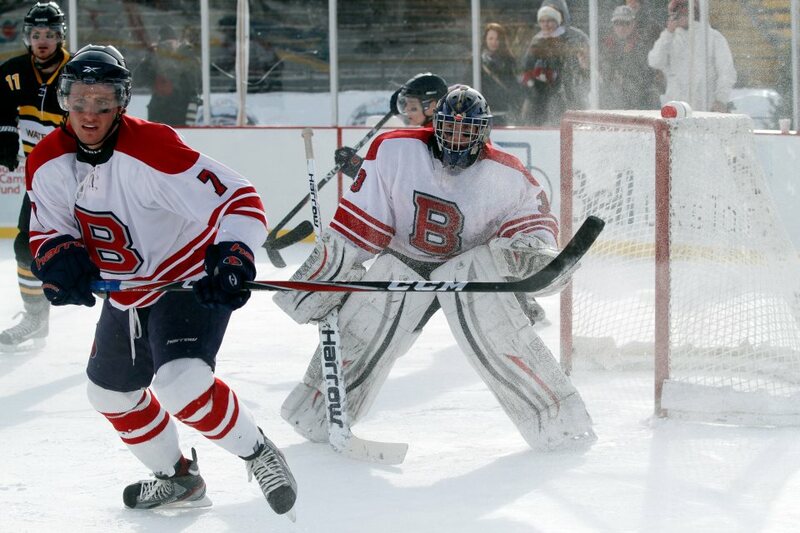 The first meeting was the last time the Capitals won a game, 6-2 over the Dogs in Duncan. A week later at the Dog Pound the Capitals came to play and the Dogs were flat for a large portion of the game. The Caps gave the Dogs everything they could handle, and had a 2-1 lead over two periods that the Dogs erased for a 3-2 win. The Caps have made some roster moves lately so I expect them to be excited to play tonight. 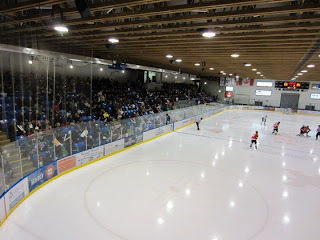 We will bring you all the action tonight on Boston Pizza Bulldogs Hockey on 93.3 The Peak FM with the Pacific Chevrolet pregame show taking to the airwaves at 6:45 with the puck drop at 7:00 with myself and Bruce MacDonald calling the action. 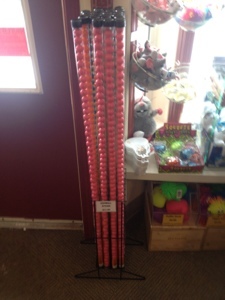 The first 400 fans entering the doors tonight will get a free pair of Thunder Stix so expect some extra noise. Local businesses have also stepped up with a bunch of prizes, so anyone that enters the building tonight can enter to win FOR FREE! Be safe, be smart tonight, don't drink and drive! Local police have stated if you are driving tonight, you WILL drive through a checkstop! Catch all the action on Boston Pizza Bulldogs hockey on 93.3 The Peak FM with the Pacific Chevrolet pregame show kicking off at 7:15 with the puck drop at 7:30 with myself and Bruce MacDonald. Very nice Christmas present for Bulldogs 20 year old Forward Manny Gialedakis, as the Bulldogs announced today that he has accepted a scholarship to Oswego State to play for the Lakers. Quite the success story, a 20 year old kid coming all the way out to BC to get a scholly. You got it Manny, now keep it going! 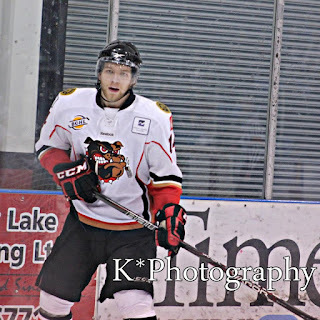 Port Alberni, BC - The Alberni Valley Bulldogs are proud to announce that 1992-born forward Manny Gialedakis has committed to the NCAA Division III program at Oswego State University of New York. 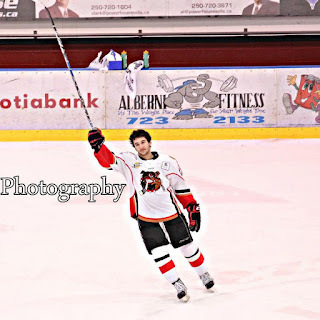 Gialedakis was acquired by the Bulldogs in mid-September from the Georgetown Raiders of the Ontario Junior Hockey League for future considerations. "I feel like its been a long time coming and I cannot be more pleased with where I'll be going,” said Gialedakis. “Oswego is a great school with an even better hockey history and to say that I will be apart of their program next year is an honor." 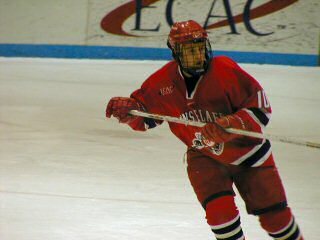 Since joining the Bulldogs, Gialedakis has been very committed to both his on-ice performance and off-ice initiatives. On the ice, Gialedakis has contributed with 11 goals and 15 assists in 30 games, including a hat trick against the Powell River Kings. Gialedakis has also been very active in the community. Shortly after joining the Bulldogs, he helped out at the SPCA walking dogs in the mornings and spent two days each week in local elementary schools as a member of the “Bulldogs In Schools” program. Gialedakis is now registered for three courses at North Island College in order to maintain his NCAA eligibility for next September. In addition to his studies at NIC, Gialedakis is also involved in the Alberni Clayoquot Regional District’s 3 R’s recycling program that will have Gialedakis join fellow teammates present the benefits or recycling in local schools. “The Alberni Valley Bulldogs are extremely happen to have been able to help Manny reach his goal and to play college hockey,” said Alberni Valley Bulldogs general manager and head coach Kevin Willison. 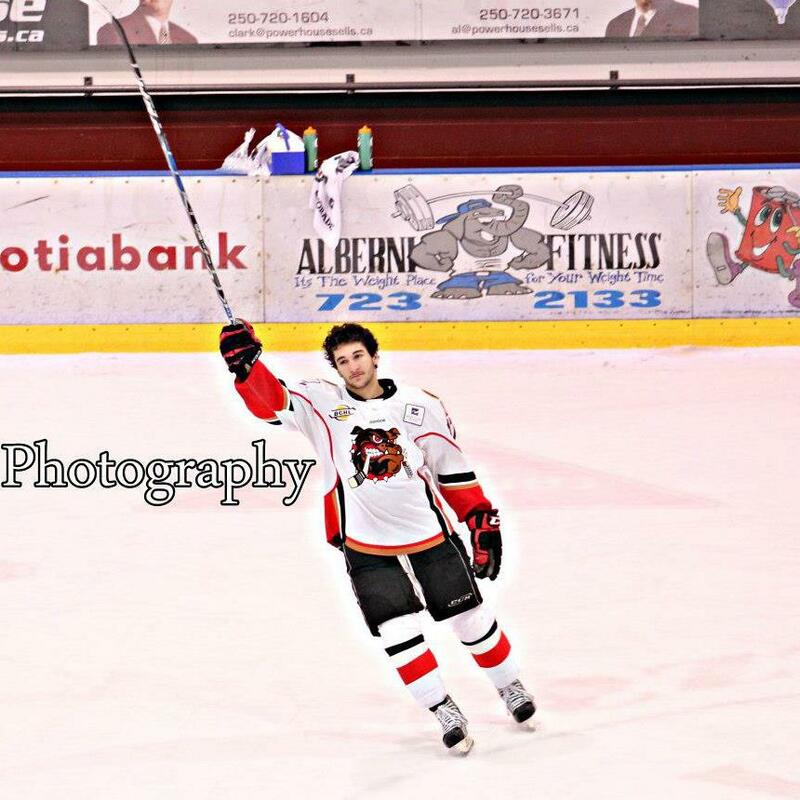 “Since arriving in Alberni, Manny has worked very hard and has proven that he can play at the next level. Manny’s determination and dedication has helped him earn this opportunity for which we congratulate him,” concluded Willison. Oswego State men’s ice hockey team sits at the No. 2 spot in the USCHO.com Division III polls. The Oswego State Lakers entered the Christmas break with a record of 9-2-0. Manny concluded with the following message: "I’d like to thank the coaching staff, Tom McEvay and former GM Spiros Anastis for giving me the all opportunities i needed to succeed. To my mentor and friend Peter Sbaraglia I say thanks for always keeping me focused on the task at hand being there for me. My billets, The Arbanas family, for opening their doors to me and treating me like one of there own. To my parents and sister, Effie, Louie, and Maria thank you for your love and support, but no words can describe how lucky I am to have you guys with me every step of the way. I couldn't be happier with the town of Port Alberni for embracing me and I could not think of a better way to finish my last year of junior hockey than to bring this town a Championship." 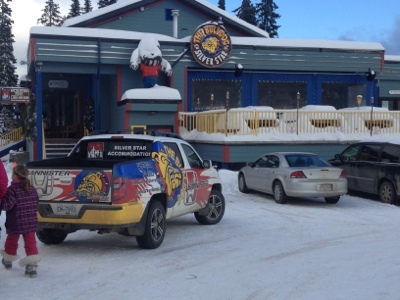 A Very Merry Bulldog / BCHL Christmas, last minute shopping! 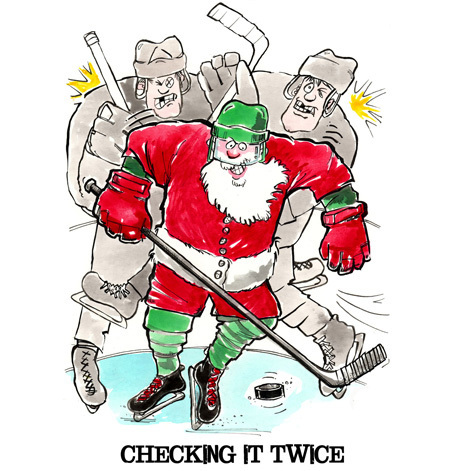 So what do the players/coaches/broadcasters etc want for Christmas? Click the below links to find out! It's my present to you! 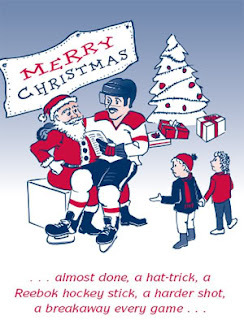 Click to listen to a "Very Merry Bulldog Christmas"
Click to listen to a "Very Merry BCHL Christmas"
If you are looking for some last minute gifts head out to the Alberni Golf Club...big thanks to Bruce for the awesome gift of personalized Golf Balls for me! They are open until 2pm today!! 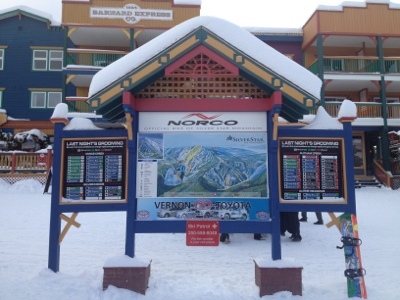 Special pricing will expire December 24th, 2012. Kurt Gosselin, Evan Tironese at The Card Corner today! Saw this last night on the Bulldogs Facebook and Twitter!! Cool! Hope everyone is enjoying their break! I've been busy finishing a recent move, getting ready for Christmas, etc! 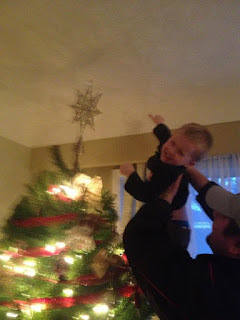 Had a trip to the "Magic Christmas Tree Forest" on Sunday and got the tree up yesterday! It's my little guy's Christmas concert today, big moment for a 2.5 year old, should be a spectacle! 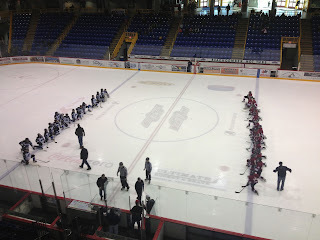 I will post audio from the Bulldogs and BCHL Christmas specials in a couple of days! Off to a Staff gathering for Christmas, take care, be safe! 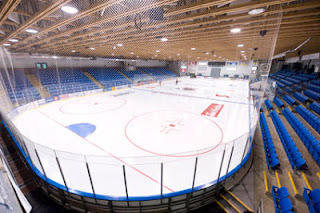 It's the final game before the Christmas break for the Bulldogs (16-11-1-4, 2nd Island) as they host the Victoria Grizzlies (20-8-0-2, 1st Island) at the Dog Pound. Don't forget that youth get into the game for just $5.00 if they wear a hockey sweater and bring a non-perishable food item for the ADSS Leadership Class Food Drive. The PAJHS will also be honouring their donors prior to the game, and there will be a meet and greet in the Upper Lounge at 6:00pm. 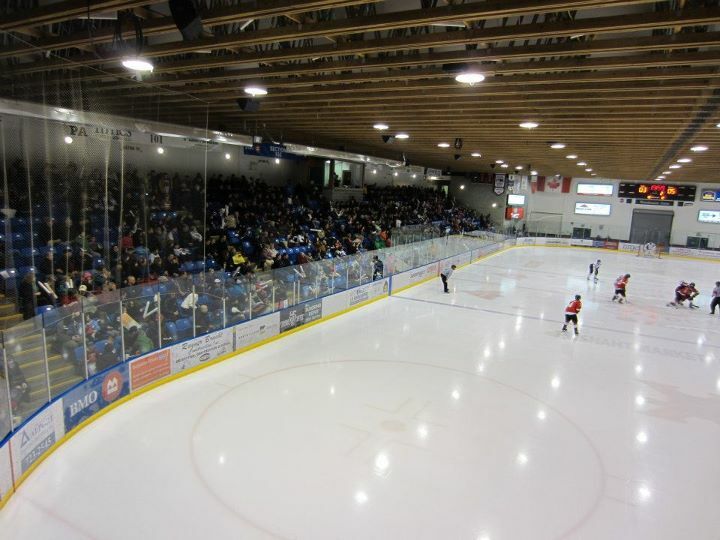 If you can't make it to the rink - certainly understandable with the amount of Christmas parties happening around town right now - get all the action on Boston Pizza Bulldogs Hockey on 93.3 The Peak FM starting with the Pacific Chevrolet pregame show at 6:45 with the puck drop and play-by-play to follow at 7:00 with myself and Bruce MacDonald. Huge thanks to Will Pulford and the folks at Pacific Chevrolet for getting involved in Bulldogs Hockey on The Peak by sponsoring the pregame show, and for being a friend and supporter of this blog, just like Van Isle Ford. Will has been a supporter of the blog and the Bulldogs since almost day one. When I met him when he came into the Radio Station to introduce himself and tape some commercials a couple years back I knew we were getting a "beauty". We spent a good half an hour talking about what Port Alberni was all about, with Will asking me about the various teams/events/groups/charities that needed sponsoring, and what people around here cared about. I knew he was going to make a positive difference around here then and he's still doing it now. From the Radio Station to the Bulldogs to Minor Hockey and other sports, to the Alberni Valley Charity Golf Classic, the Festival of Trees, Kidsport and everything in between THANKS WILL, the city appreciates it, my family appreciates it! It's now time for my Christmas present to you! People that have been following the team for a while now have no doubt been expecting this for a while. New fans might be a little surprised! Every year I try to do something around the holidays to give back to the fans a little bit, and to spread good cheer over the holidays. It blows my mind and always has since the day I arrived here so many moons ago that people give ME gifts around this time of year. Cards, presents, good drink and good food, donations to the blog fund - don't get me wrong, it's all VERY VERY appreciated...it has always in my head just been about me doing my job, not something I should be getting gifts for...when I say this most people just say something along the lines of "well you go above and beyond" or "you really do put everything into it, we appreciate it"
My thanks and my gift to you will air during the broadcast tonight! In the 1st intermission catch "A Very Merry Bulldog Christmas" and in the 2nd intermission catch "A Very Merry BCHL Christmas"
The format is simple - I talked to the Bulldogs Coaches/Staff/Players and the other BCHL clubs Coaches and Broadcasters and I asked them to share with us the items from their Christmas Wish List, and I also gave them the chance to send out their own special Christmas Greeting! 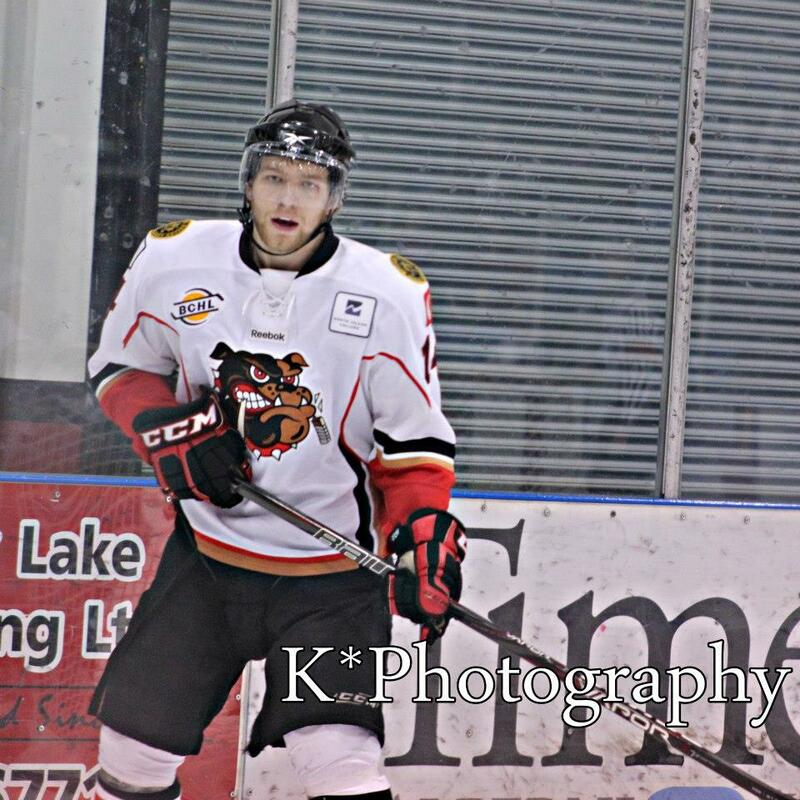 Port Alberni, BC – The Alberni Valley Bulldogs announce today that Eric Walker has been called up by the Portland Winterhawks in the WHL. Walker goes to the ‘Hawks on an emergency call-up as they have 3 defensemen invited to Canada’s world junior national team selection camp in Calgary, AB. Walker will be evaluated by Portland’s coaching staff and it is yet to be determined if Walker will stick with the WHL club. “We wish Eric all the best with this opportunity to, again, play in the WHL,” said Bulldogs General Manager and Head Coach Kevin Willison. “He is getting a second chance to prove he can play at that level,” added Willison. As this opportunity presents itself to Walker, it leaves the Bulldogs with a hole to fill on the back end. I am very sad to see Eric go - he bought a lot to the team. He played with HEART, he played with a mean edge, he played very very HARD and brought a physical aspect that was lacking. When he dumped the puck, when he cleared the puck, he did it with purpose. Plain and simple, he made the Dogs better, and he wore the jersey proudly. Best of luck in Portland "Walks" as you certainly deserve this opportunity with how you played in the Dogs uniform. I selfishly hope you come back, at the same time I wish you success. Great kid, the team will miss him, and here's hoping someone steps up to try and fill the void. The Bulldogs are holding an "Everyone Welcome" skate tonight at the Multplex in the Winter Wonderland! 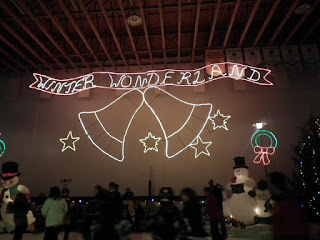 The skate gets underway at 6:30, rentals are free, everyone is welcome! It's going to be a busy day for me as I'm moving - I know, great timing right? I'm still hoping to get there tonight with my little guy Griff! 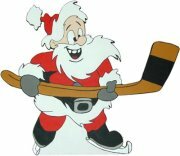 BIG PLANS for the final game before Christmas this Saturday when the Dogs host the Grizzlies...Minor Hockey kids get in for just FIVE BUCKS, yes $5.00 if they bring a non perishable food item and if they wear their team jersey! It's in conjunction with the efforts of the ADSS Leadership Class to gather as much non-perishables as possible. The PAJHS is also honoring donors before the game, and hoping to have some words on the mic in the Upper Lounge after 6pm. 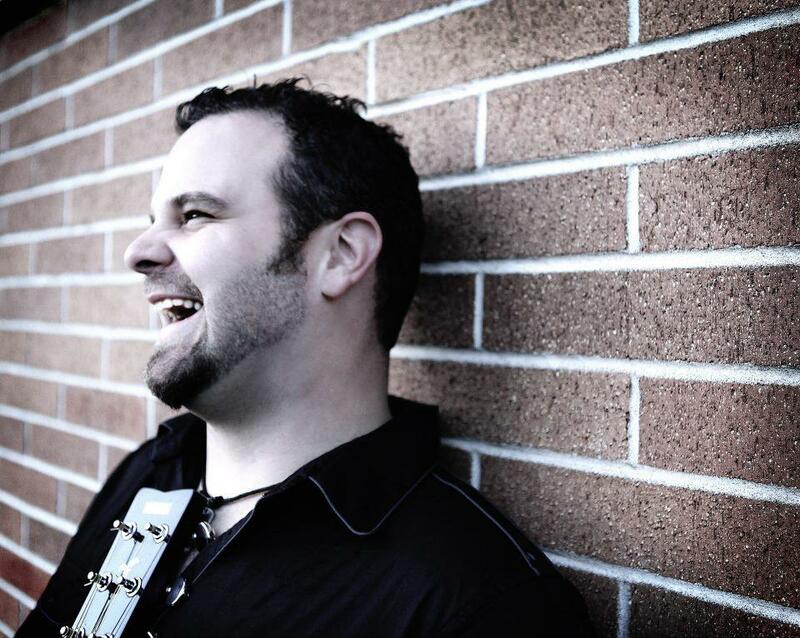 Lance Lapointe is also playing live in the Upper Lounge! You make the call...Goal? No Goal? My call was obviously GOAL, or SCOOORES, for anyone that listened or watched the game. I believe the camera is on the concourse, about 10 to 15 feet below me up in the booth. I'm also further down to the right towards the Warrior net, so I had the prime view to see it go up, back bar and back out. It is hard to see at the video but on the first look I think I can see the mesh move, and I also think on both looks I can see it hit the white back middle bar on the way down. I might be only seeing that because the Warriors Music Man next to me told me the Warriors PA Announcer had a picture that captured the puck on the middle bar. When he showed me the pic, it's what I saw too. Almost everyone I have talked to, INCLUDING the other side of the puck agrees it was in. However, everyone has their opinion, in the end the officials have the last call. Of course it doesn't matter now, I'm tired of controversies period after the end of all three games this weekend. I don't want to be on the officials, these three games show how hard the game is to call, I wouldn't want to be them! I'm only addressing it now because I have lost count at the amount of messages I have received last night and today on the topic! Great job the Warriors on the video! 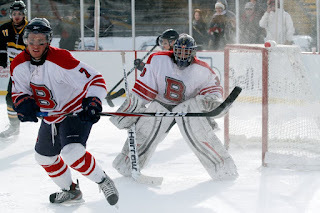 "Hansen's rising shot appeared to beat Tyler Briggs high glove side, however, referee Jim Maniago ruled the puck did not cross the goal line. Replays clearly showed the puck hit the back bar and quickly came out, landing under Brigg's pad. 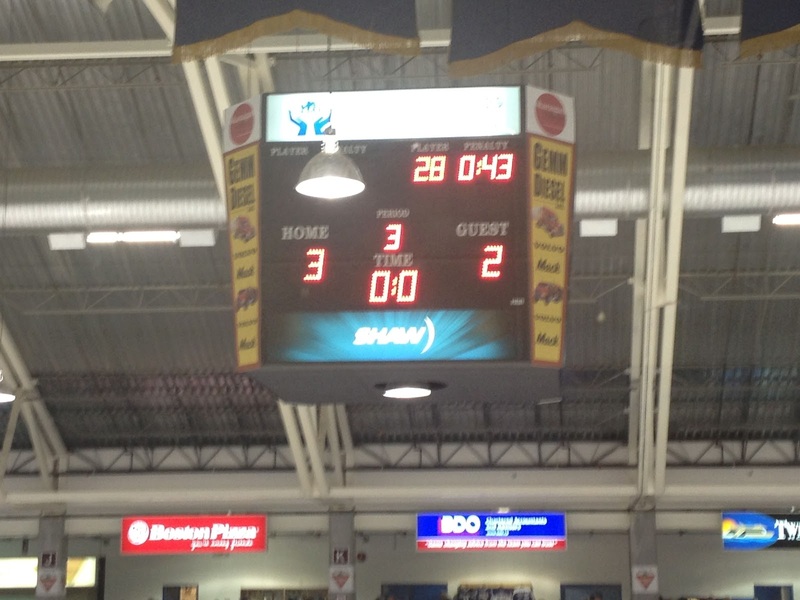 The call negated the Bulldogs a second point in the standings." Great minds thinks alike Wayne...or fools seldom differ! Quite the comeback after an atrocious start, with the Dogs digging out of a 3-0 hole to tie the Warriors at 3-3. Here's hoping we can make the Ferry home now! It's the end of the road today for the Bulldogs (16-11-0-4, 2nd Island) as they finish their three game roadie when they visit the Warriors (12-8-1-6, 3rd Interior) at Royal Lepage Place. Post game run - need to get that lactic acid out! 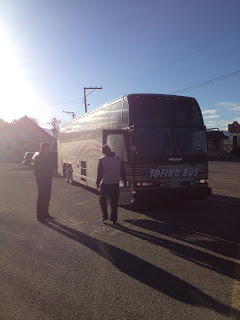 Roadie finishes in West Kelowna tomorrow, a 2:15 pregame show and a 2:30 puck drop. 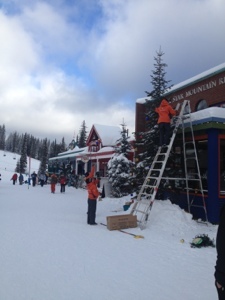 First time for me getting up to Silver Star, very nice place! Weird to see so much snow! 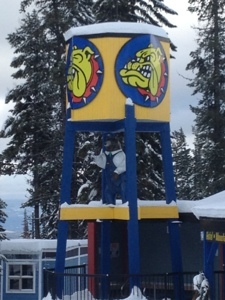 It's a nice sunny day here in Vernon as the Bulldogs (15-11-0-4, 2nd Island) visit the Vipers (10-12-0-7, 6th Interior) for the second and final time this season on the Vipers Teddy Bear Toss night. 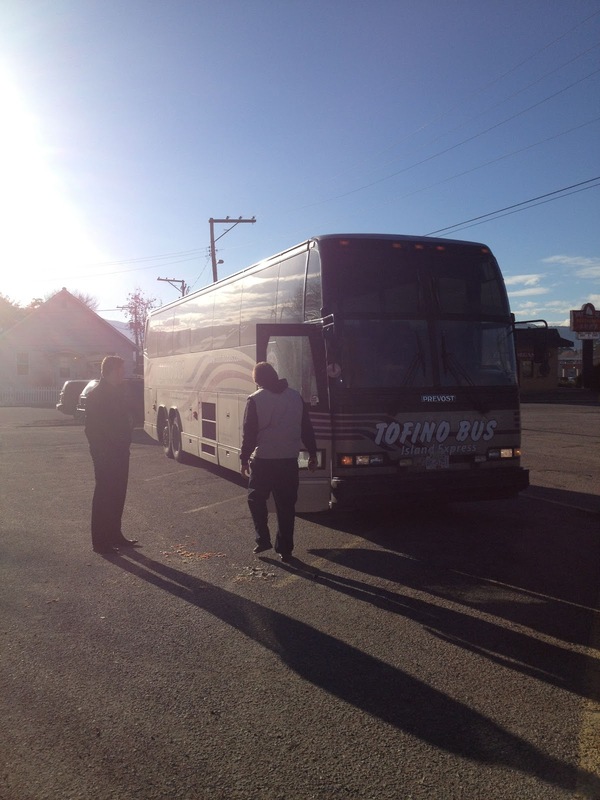 As the team doesn't have any travel today, the Coaching Staff has planned some togetherness and sightseeing. 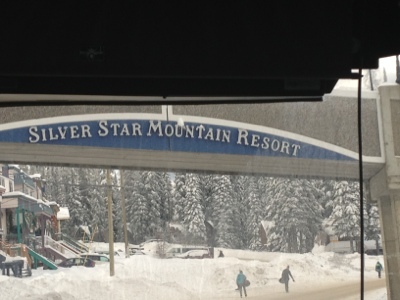 We are currently en route to Silver Star Mountain Resort to see the sights and sounds! 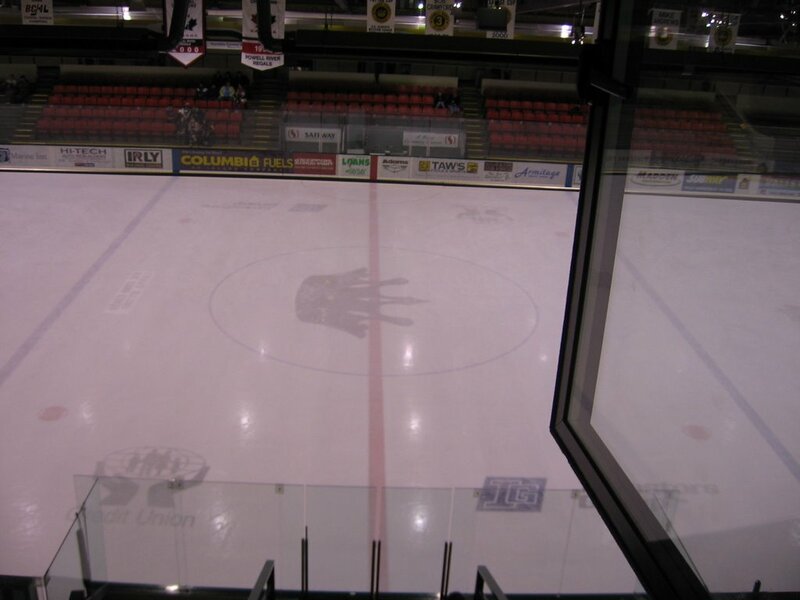 Nice aerial view from the Broadcast Booth here in Vernon! Catch all the action on 93.3 The Peak FM tonight with the pregame show at 6:45 (here's hoping) with the play-by-play to follow at 7:00. Tonight's 2nd intermission guest is West Kelowna Warriors play-by-play voice Jon Zacks. 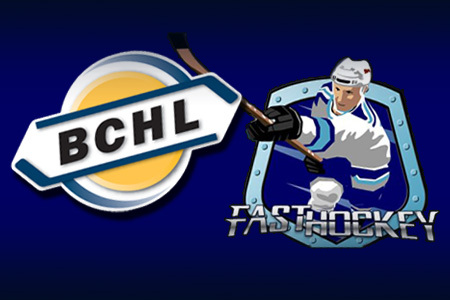 The game is also available to watch on Fast Hockey on pay-per-view. I understand there were problems last night getting the FastHockey feed going out of Salmon Arm - but here's hoping there are no problems in Vernon. Seemed to be a problem with the camera in Salmon Arm, totally out of my control but accept my apologies anyway! Pictures to come from the Mountain. Ah, quite the lovely sight here in Vernon - the outdoor rink! Both teams are coming off of wins entering play tonight - the Bulldogs have won three straight, the Silverbacks topped the defending National Champion Vees 3-2 in double OT on Saturday. 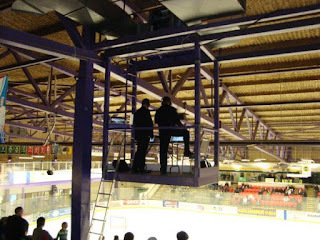 I have always enjoyed going to Salmon Arm - good atmosphere, good fans, and good people up in the Broadcast Booth - even if it's also the music/public address/jumbo tron booth and we are jammed elbow to elbow! 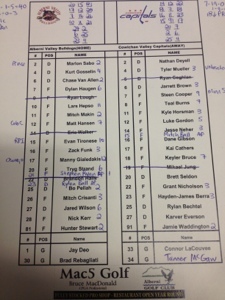 Vernon Viper Play-by-Play Voice Todd Miller is my 2nd intermission guest.